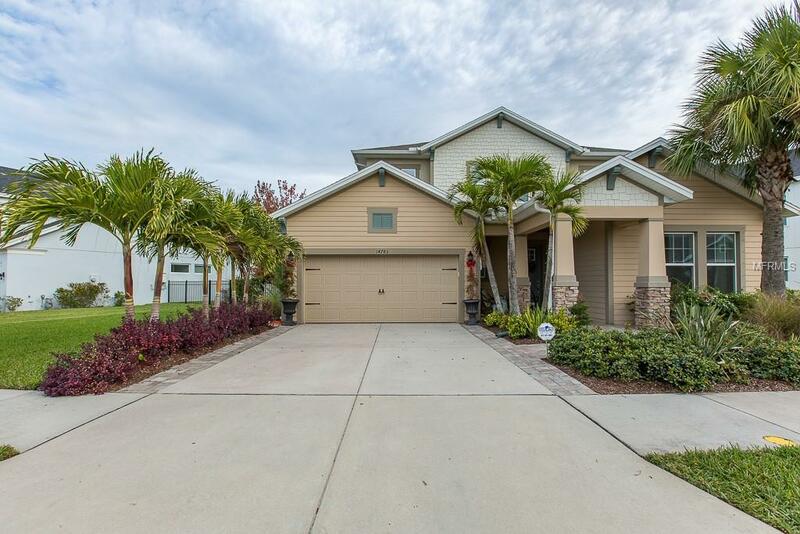 Gorgeous DAVID WEEKLEY waterfront home, split floor plan and loaded with upgrades! 5 bedrooms, 3 1/2 baths, and 3 car garage plus bonus room upstairs. Beautifully paved screened patio overlooks serene views of the lake. Master suite and second bedroom downstairs. Gourmet Chef's dream kitchen with plenty of granite countertops, stainless steel appliances, 43" kitchen cabinets, and large island. Upgraded wood laminate flooring, upgraded master bath tile. Reverse osmosis, hot tub (can be purchased), paved entry, wrought iron fenced backyard with two gates. This home has natural gas, newer HVAC system, automatic zoned sprinkler system with reclaimed water that can save you a lot of costs very energy efficient. Enjoy the resort style community pool area, the fitness center, clubhouse, playground and nature walk paths or for your furry friends the dog park. Asturia is a new neighborhood with a lot of amenities, great schools & easy access to the Suncoast Parkway, shopping, beaches, Trinity Hospital and so much more!